Reason #1: Because the intersection represented in this not-to-scale diagram is very small. The red circle is the real killer. That shouldn't be a surprise to anyone who has read this blog before. Something about having 2-3 fulltime jobs and only 24 hours in a day. WHATEVER. I do tend to talk about things on Twitter and Facebook from time to time, so I'm not silent (most of you probably got here from one of those platforms, so you know). There has just been very little I have required a long-form medium for. I know. I completely ruined the Venn diagram thing I had going. But you know what? That's what anxiety does it ruins everything and makes you talk in all-italic run-on sentences. Before you worry about me too much, don't. My anxiety is relatively mild and hasn't lasted for more than a couple of days at a time (I only had one really bad weekend a few weeks ago). I don't even know that it would count as clinical anxiety. I just know that whenever I thought about writing a post on something, my brain shouted, "HERE ARE ALL THE REASONS YOU SHOULDN'T DO THAT, YOU UTTER SCREW-UP!" and then it would launch a 3-hour marathon of Pen-Pineapple-Apple-Pen. Mainly, I just had to remind myself to focus on my work, take a walk, get off social media, and talk to my three-dimensional loved ones (though not all at the same time). I won't say my anxiety is over, because the triggers are all still out there, but I'm coping all right. 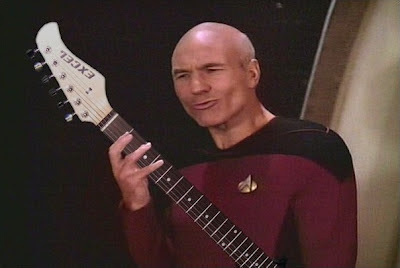 Anyway, I'm just letting you know the blog still isn't dead. It may never be (because where else would I post long-form thoughts? ), and it's definitely not dead now. So. How are you guys doing? 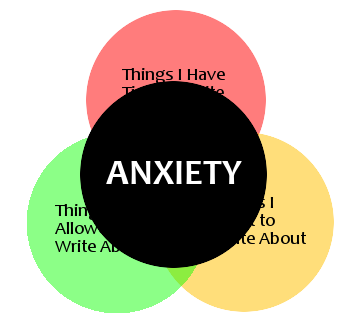 And hey, how do you deal with anxiety when it pops up in your life (for those of you in whom it does)? I'm officially lowering my commitment to this blog, for obvious reasons. I will keep up the First Impact posts as long as I have submissions, and I'll post other things when I've got the time/inclination. But I need to give myself the freedom to back off my M/W/F schedule. The new official schedule is "One to Three Times a Week and If I Miss a Week I'm Sorry." I highly recommend the RSS feed or an e-mail subscription if you are one of those who still checks websites on specific days. I don't even need to read the comments to know you understand. I know you guys, and you are AWESOME. Three posts a week isn't even really hectic, but it does weigh on me as One More Thing. And when I've got too many Things weighing on me, the harder-but-more-important ones (like writing or playing games with my kids) get skipped. 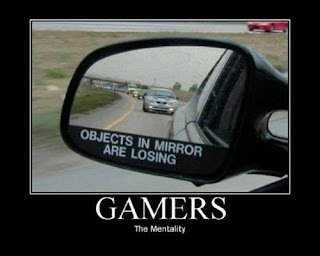 And yes, playing games with my kids is hard. They have no attention span, so I have to triple mine to compensate. About a year ago, I took a look at the growth of this blog, what I thought was working and wasn't. It looks like a heck of a lot has changed in a year. I don't intentionally write Google bait, but the vast majority of daily hits come here from Google. They come looking for images of steampunk, board games, Lord of the Rings, Dune, and various classic novels (assuming those last two are students looking for an easy book report: let me know what grade I'm getting, m'kay, guys?). Before I got an agent, blog growth jumped around September 2011. Sometimes posts just hit a nerve, and then people link them so they can hit more nerves. For me, some of those posts were: Why Haven't You Self-Published Yet, What Do Agents Owe You, and Writing When You Hate Writing. Hits don't mean readers. All those folks who found me on a Google image search are unlikely to stick around for more. I think the Google hits from that one steampunk post prove that. Even hits from getting an agent don't automatically mean readers. Honestly, a lot of the growth since December is due to other nerve-striking posts: The Offer I Turned Down, What Makes a Query Letter Awesome, The Thing About Rue and Racism, etc. So what do I think gets readers? Content People Talk About. But how to write content people talk about . . . Heck, I don't know. 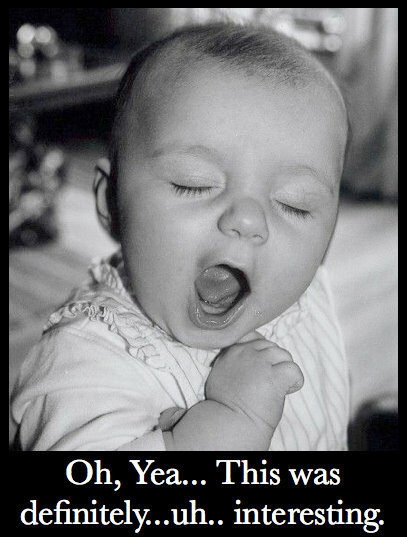 For every post that got retweeted, there were a dozen or so that only you (my loyal readers) noticed. If I knew how to hit a nerve every time, I'd be rich. Know your audience (from the post titles, clearly my audience is writers). Write stuff nobody else is writing. As I said in last year's post: "Honestly, this is stuff anyone can do." What do you think? How did you find this blog, and why do you stick around? Every time I see a blog shutdown, or hear someone lament how nobody reads blogs anymore, I get all worried. "Is my blog a waste of time? Should I focus my energy somewhere else, like Tumblr or Pinterest or dear-God-anything-but-Google-Plus?" I don't think this blog is a waste (and your response to our family's emergency a couple of weeks ago just proves it to me). Blogs are basically the same as all the other places online. It's just a matter of how people interact and whether you prefer to express your thoughts in pictures, words, or 140 characters. 2) You blog for you. We all know you can't please everybody, but the good news is you don't have to. Write what you want and get the word out there. You won't collect people just by sending them to your blog, but you will collect a percentage. That percentage is your people. 3) You blog for your people. We read blogs (and tweets and Facebook statuses and everything else) for information and/or entertainment. Do your best to give them what they want. What do you think? Is blogging a waste of time? Why or why not? Which Prize Would You Like? If I were to, say, run semi-regular contests around here, what sorts of prizes would you be most interested in, do you think? For those suggesting their own prizes in the comments, remember this is for science; try to be mostly serious. Emmet, I'm looking at you. Daddy, Where Do Crit Partners Come From? I don't technically have a critique group. I don't meet with other writers on a regular basis, and the only person who sees my chapters as they come out is my wife. Part of that is there just aren't a lot of sci-fi/fantasy writers in Chiang Mai (though admittedly I haven't looked very hard, what with my abject terror of new things). So I don't have a group, per se, but I do have critique partners -- those hardened souls committed to reading through the garbage I send them. I collect them the way other people collect Pokemon (though my crit partners complain a lot more when I try to stick them in those little balls). 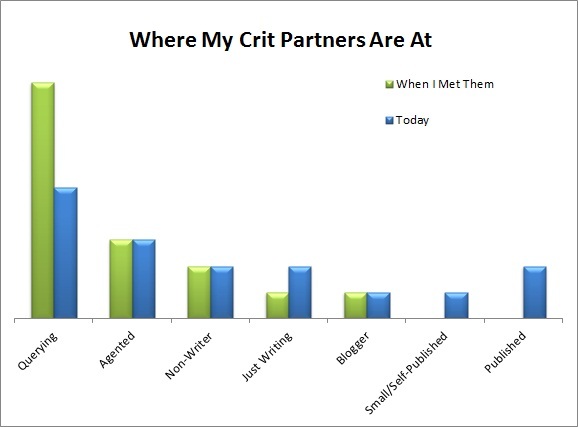 Whenever people ask how to find good crit partners, I want to make a chart. Actually, that's misleading: I always want to make a chart. Blogging: Either they found my blog or I found theirs. We commented. We discovered common interests. Then one day, one of us tweeted or e-mailed The Question, and a crit partner relationship was formed. 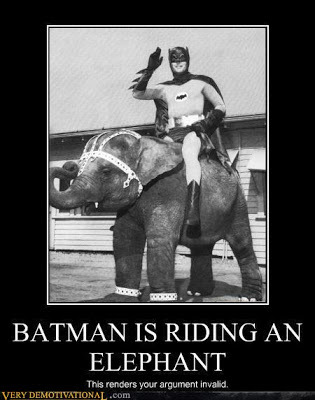 Real Life: I hope this is self-explanatory. Twitter: Similar to blogging, except I either never knew this person had a blog or I didn't follow it until later. Through Agent: Not a road everyone can take, but I have recently collected crit partners because we share representation. Critters.org: A great site if you want to exercise your critting muscles. And every once in a while, a stronger relationship is formed. Conclusions? Well, blogging and reading blogs has been ridiculously profitable for me in terms of crit partners, but it's not the only road. And it's certainly not the fastest (I've been blogging for 4 years now). What's interesting to me is that, when we met each other, most of my crit partners were at the same spot as I was, and none of them were published. But 4 years later, I now have Real Live Published Authors who will happily read my stuff. That's kind of crazy to me, but I guess this is how it happens -- not by approaching the unapproachable, but by forming long-term relationships and sticking with them. 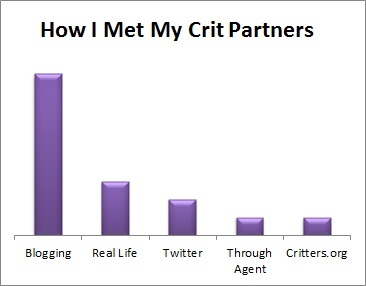 Where do you find your crit partners? Have any advice for people who have none? 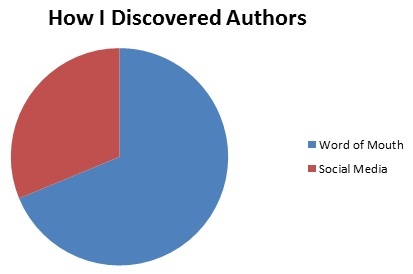 Does Social Media Affect What Books You Buy? A little while ago, The Intern had an interesting post on how much (or how little) social media promotion efforts affect sales. She challenged her readers to take a look at how many books they'd bought because of social media efforts vs. traditional methods (like, say, word of mouth). I chose 45% because I knew the author (meaning I had read one of their books before and liked it). I chose 35% because of word of mouth (meaning a trusted friend told me I should read the book). I chose 20% because of social media (meaning I discovered the book independently, from twitter, facebook, blogs, book trailers, etc). 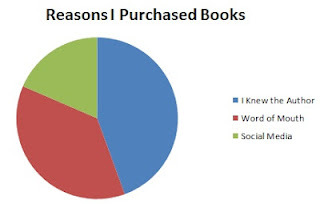 I thought that might be a little misleading, since many of the books in that first category were purchased after I discovered the author via other means (for example, after I discovered Brandon Sanderson and read MISTBORN, I bought three more of his books). So I looked at how I discovered these authors. I heard of 70% from word of mouth. I heard of 30% from social media. So does social media work? Well, it worked for me, but there's one statistic I haven't mentioned. Why did I choose 2008 as my cut-off? Because I wasn't even on social media before then. Before 2008, 100% of the books I purchased were authors I knew or discovered by word of mouth. So does social media work for reaching readers? I think it's a starting point. But I don't think it's worth plunging hours and hours and days into. 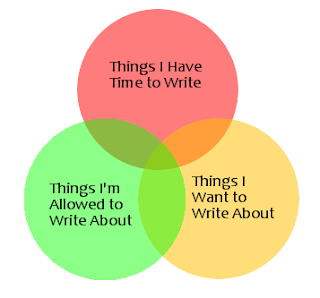 I do think it's a fantastic tool to network with other writers though. I got my ill-fated referral that way, along with some of the most awesome critique partners in the business. And Jay Kristoff recently blogged about how both Beth Revis and Scott Freaking Westerfeld discovered him and offered to read his book for a possible blurb (which upsets me, because I wanted Scott F. Westerfeld to blurb my novel, but I guess you have to have a book deal first). Man, this publicity stuff is complicated. Does it ever work? What do you think? Unpublished writers' blogs are a strange beast. They're part community-building, part writing practice, and part planning for a hopeful future in which we need a platform. It's that last bit I want to talk about today. Aspiring writers who blog are sometimes told they shouldn't write for other writers. I can understand that. I mean, you want to reach your future target audience (who is interested in your books), not other writers (who may or may not be). But I wonder why my future audience (who wants to read my books, but doesn't write themselves) would be interested in my blog if I don't actually have any books (especially with all these parentheticals)? Here's the thing. Your target audience is, in fact, a moving target. I'm not saying there's no merit in expanding your blog topics to other things. There is, but I don't think Professional Aspiring Writers should feel like they can't blog about writing either. Because at the moment, the writing community is our target audience. Tobias Buckell ran down his readership stats the other day, and one thing that interested me was that, early on, he lost over half his readers when he became published. He says it's because he was no longer talking to "writers trying to sell a novel (large pool), but to writers who had already sold a novel and were trying to figure out what to do (very much smaller pool)." Gradually, he shifted his blog to broader topics, tangentially related to his novels. Could he have avoided that drop by shifting his blog sooner? Maybe. Or maybe that new audience wouldn't have been as interested in his opinion before he was a published author. Also maybe those early years of blogging to aspiring writers was needed networking for him. I don't know. My point is that, either way, it's okay. I think the platform-building (future audience) is a good idea, both for practice and laying the groundwork. I think the community-building (current audience) is also good for networking and (in my case) general sanity. So don't feel like you have to blog one way or another. Do think about your future audience, but don't stress about them, because if you're like me, you have an audience here right now. Maybe it'll change one day, but you can change with it. It'll be all right. Blog Schedules: Do You Even Notice? You may have noticed that Susan's guest post went up on Tuesday -- normally an off-day for Author's Echo -- but also that there was no post on Wednesday. Or maybe you didn't notice! That's what this poll is about. See, I've seen conflicting advice on the subject of blog schedules. Most professional bloggers say you need a schedule so your audience knows what to expect. I get that. That's one reason I blog M/W/F (usually). But other advice says don't worry about it. E-mail subscriptions and feed services like Google Reader make blog schedules superfluous. I get that too, considering I don't actually know what anyone's schedule is. I just read whatever's in Google Reader whenever it's there. Why Aren't You Linking Yet? It is 2011. The internet as we know it is old. It's older than the Matrix and Star Wars Special Edition. It was born in a time when Michael Keaton was still Batman, Joe Montana was a 49er, and people freaked out because Mortal Kombat was too bloody. So why are people still writing comments like they've never seen a link before? Look, I know HTML is ugly and non-intuitive, but it's not hard either, and it'll make your comments a lot less ugly than that URL up there. Here's how it works. We'll start with bold and italics, cuz they're easy. Whatever you want formatted gets stuck between a start tag and an end tag. For example: "I <b>love</b> cookie dough!" becomes "I love cookie dough!" Tags always look the same: angle brackets around the tag name (b for bold, i for italics, etc), and an extra '/' in the end tag. I see your eyes glazing over. Stop it! This isn't hard, and you'll look smarter and get more clicks to your blog. Keep going! Great post! 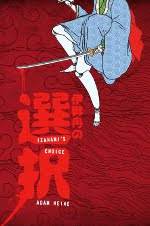 And did you hear <a href="http://www.adamheine.com/2011/03/dear-hollywood-asians-are-cool.html">they're casting white actors for Akira</a>? I know, right! Great post! And did you hear they're casting white actors for Akira? I know, right! There, was that so hard? Nearly every comment system allows these basic HTML tags. And look! One person actually clicked on the link. Now you can get that warm fuzzy feeling that comes every time your visitor stats go up. Oh, you...you don't know how to check those either? Well, poop. * If it helps, 'a' is short for anchor and 'href' stands for hyperlink reference. I'm sure it made lots of sense at the time. Everyone says you need a professional-looking website, but a professional setup and design can cost hundreds of dollars and a monthly hosting fee. If your website is making you money (for example, by selling books), that can be worth it. Otherwise, you want something that's both Free and Good Enough. Whenever I tweak things on this site, I have four goals, many of them conflicting: (1) Make my blog nice to read/look at, (2) Differentiate it from every other blog out there, (3) Rarely mess with the template (HTML, CSS, and other scary acronyms), and (4) Spend little or no money. If that sounds good to you, read on. STEP #1: GET A FREE BLOG. Blogger is my favorite. It's relatively reliable and gives me a decent amount of control (though those qualifiers are important). You could also go with Wordpress.com, LiveJournal, or many others. None of them give you total control, of course. For that, you'd have to buy your own webhost and deal with your own technical setup and issues, which defies goals (3) and (4). STEP #2: CUSTOMIZE YOUR TEMPLATE. Get a custom background. Especially if you're good with a camera/live somewhere pretty. Make a custom header. Free fonts and your local Paint program can surprise you. Photoshop and a little design sense is even better. Tweak the heck out of it. Blogger, for example, lets you change the format, fonts, sizes, and colors of almost every little thing. Take advantage of it. STEP #2A: MAKE EVERYTHING READABLE. Fancy fonts and wacky colors will definitely make your blog unique, but don't go crazy. Everyone's screen and color resolution is different (some folks are even reading you on their phones!). The text needs to be big enough and plain enough to be readable. And the text color should contrast as strongly as possible with the background. Here's where I tell you to use dark text on a light background. I know people disagree with this, but white-on-black burns my retinas like those creepy Jesus illusions. I won't say don't do it, but at least think twice before you do. STEP #3: ORGANIZE YOUR INFO. People come to your blog for two reasons: (1) to read your latest update or (2) to find specific information about you/your blog. Every blog makes the former easy -- it's right there in the middle. It's your job to make the latter easy to find. Static pages are a good place to put professional stuff. The kind of stuff agents come looking for. Pages put that info right at the top (usually), give you space to write as much info as you need/want, and keep that stuff (which is usually old news to your regular readers) from cluttering your sidebar. Think about what you want readers to see, and put that on top. (OPTIONAL) STEP #4: REMOVE REFERENCES TO YOUR FREE HOST. Free hosts insert their brand everywhere. Search bars on the top, mandatory attributions in the footer, and of course the domain name. You can usually get rid of this stuff, but it requires either messing with the template or paying money. But often, it's not hard either. Removing the Blogger search bar is a single line of CSS, for example, and a custom domain name costs only $10-15 per year. It's up to you whether that's worth it. Many of you already have beautiful blogs (I know, I've seen them). So tell me what decisions have gone into your blog? What other tips would you offer? Okay, that's a lie. I just want to geek out about statistics. This blog has been running since May 2008. Other than the spikes, you can see that it has had a pretty steady growth. Let's take a look at the spikes, the dips, and things I think should've affected this growth but didn't. Both spikes were a direct result of someone linking to a post (this one in Oct 2009 and this one a year later, though I think that first spike is a fluke ... as I recall, most of those visitors came from Google looking for this picture). Although I definitely gained readers both times, there was no significant, long term change in the blog's readership, no matter how big the spike. This is almost certainly due to the lack of swearing, drinking, and scantily-clad women on my blog needed to keep people coming back. The dips are usually when I posted less, like last August when I disappeared for two weeks. Makes sense in a graph that shows monthly readership as opposed to per post. MORAL: Post more often to artificially boost my number of readers per month. In Nov 2008, I started posting blog links on Facebook and Twitter. There's a little growth, but not what I'd call significant. In Sep 2009, I started posting on a regular schedule. Again, there's growth, but that's more easily explained by the fact I went to 13 posts/month instead of 8 (see moral to THE DIPS, above). In Apr 2010, I got published and ran a contest. I got a few extra page loads that month (usually indicative of new people checking out old posts), but otherwise no big change. MORAL: Nothing matters. Give up. I don't really believe nothing matters. The graph obviously shows growth, but it also shows there's no single event to magically boost your readers (at least not this side of being agented). I'd say the growth correlates more with me getting better at social media than anything else--commenting on blogs, interacting on Twitter/Facebook, stuff like that. Not that I'm awesome (I'm SO not), but I try to figure out what people do and do not like to read, and then give them that while still being me. And I'm slowly learning how to actually talk to people, even if it's just over the internet. Honestly, this is stuff anyone can do. So do you keep track of your readership stats? Have you noticed any trends in what works or doesn't? This blog is going quiet for a couple of weeks for obvious reasons. Not that Thailand celebrates Christmas, but our family does, as do the 7+ relatives/friends here to visit. I should be back on January 3rd. 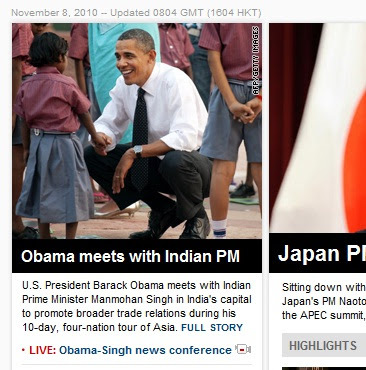 Until then, enjoy this undoctored screenshot of CNN.com, and meditate on the importance of choosing the right picture to go with your words. If You Don't Know Your Audience, Create One! 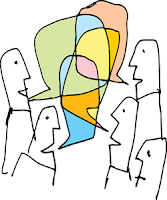 Writers often hear that we're supposed to know our audience so we can write for them. It's good advice, but what if you don't know what your audience wants? What if you're not even sure whether you have one? I say great! Write whatever the heck you want! Take this blog, for example. When I threw up a couple of Venn diagrams on Wednesday, I knew you guys would eat it up. How did I know that? Did I do intense market research as to what kind of pictures my average blog reader enjoys? Did I run a survey of what you guys want to see in my posts? No! (Well, yes, but it didn't work). You may not be aware of this, but I CREATED YOU! Not in the metaphysical or biological sense, but as a collective. See, I put those diagrams up because I like Venn diagrams. It's the same reason I post charts, graphs, formulas, flowcharts, and more Venn diagrams. I'm a geek. But here's what happens. I post, say, a comparison table of the Emperor and the Lord Marshal. Someone new comes along, reads it, loves it, and sticks around hoping for more. And because I'm a geek, eventually I do post more, and waddyaknowmyaudiencelovesit. You see? And I didn't do anything except be me. Granted, there is some filtering going on. (I don't bore you with the meteorology of the Air Pirates world, for example). But my point is that you don't have to make people like you or what you write. Just do what you do -- in the most interesting way you know how to do it -- and eventually the people who like that kind of stuff will find you. And bam. There's your audience.